Being a housewife, you don't have a boss telling you what to do and when to do it so its important to be a self-starter and stay motivated. Having a to-do list always helps me to stay on task and get the job done. When I follow a cleaning schedule, my house stays neat and I have freedom to sew, knit and do projects with the kids in the afternoon. Here's how I made my home keeping schedule work for me. If you're a pen and paper kind of girl, there's lots of gorgeous day planners and calendars out there too! I also pulled up these great printable to-do lists from Martha Stewart. There are lists for seasonal home keeping projects, monthly cleaning tasks and all kinds of things to keep the house tidy, organized and running smoothly. I adjusted some of those things to my own needs and added them to my Cozi calendar so I'm reminded when its time to change air filters, service the furnace, seed the lawn and all of those good things. I'm sure that we don't all wipe down our switch plates monthly like Ms. Stewart supposedly does but you can use her lists as a starting point for your to-do list brainstorming session. On the Cozi app, you can add tasks that repeat weekly or monthly so if you want to remember to vacuum the baseboards of the closets regularly or flush the drains with boiling water, you can have that task repeat as often as you want to do it. Making your own schedule is easy and kind of fun to do. My best advice is to start with a completely clean house. 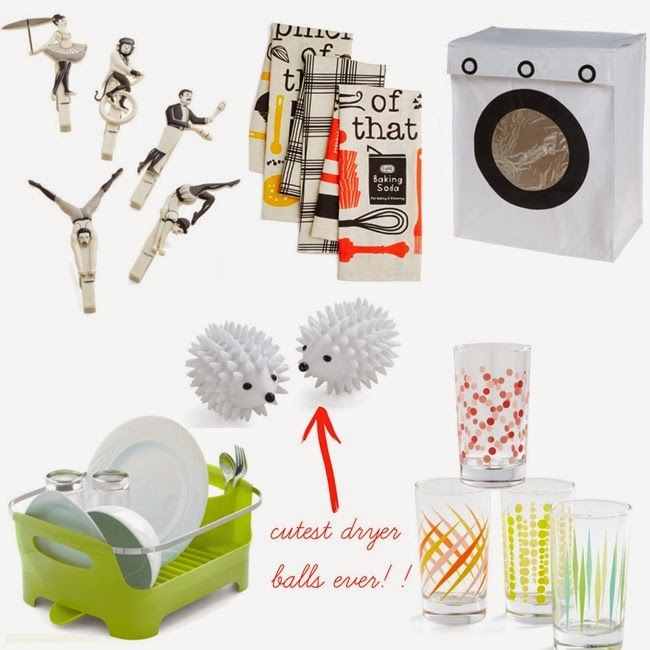 Spend some time cleaning and organizing cabinets, drawers and closets. With everything in its place, you will have a better idea of what tasks need to be done daily, weekly and monthly and you can add those long-awaited projects (like my re-painting the kitchen) to your list. 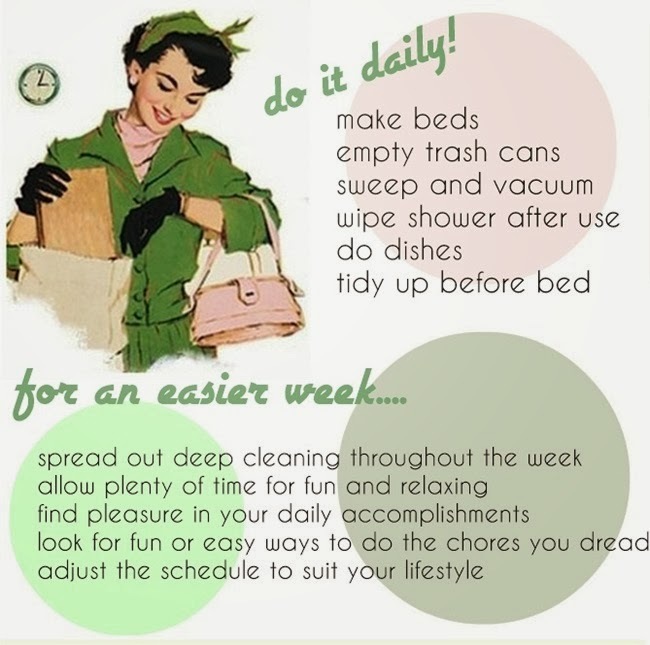 Also, with a freshly cleaned and organized home, it'll be easier to stay on top of it and you'll have more free time to have fun! 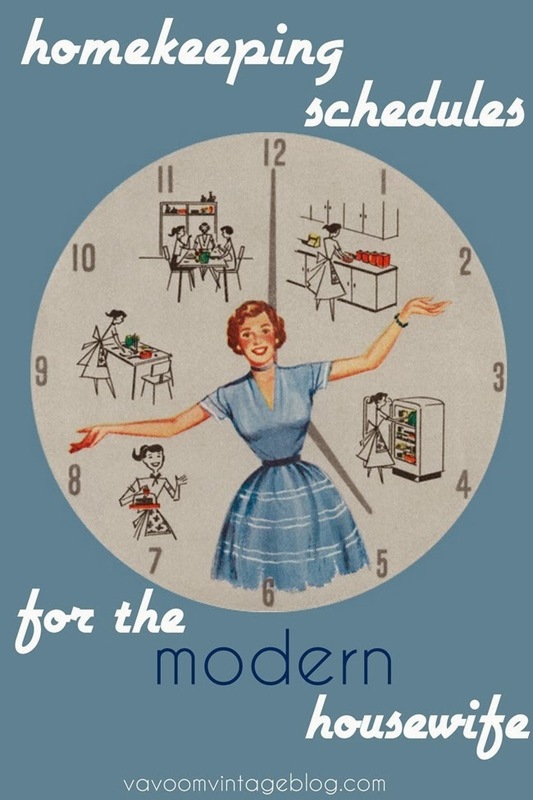 We're not all born being domestic goddesses so it never hurts to get some tips from the experts on how to work smarter, not harder. I've found some priceless wisdom on cleaning house, fixing things and maintaining things from Heloise. She has some wonderful tips on living frugally and using a lot of home keeping methods that our vintage housewives would have used. For more housekeeping inspiration check out my Pinterest board, "Tidy Up" for over 100 brilliant cleaning and organizing ideas. Happy cleaning! Great ideas, I saw your pinterest board earlier today. Great ideas. I love the clothes pins from mod cloth. I never got around using Cozi, but I have been using Flylady that Cozi sprung from. 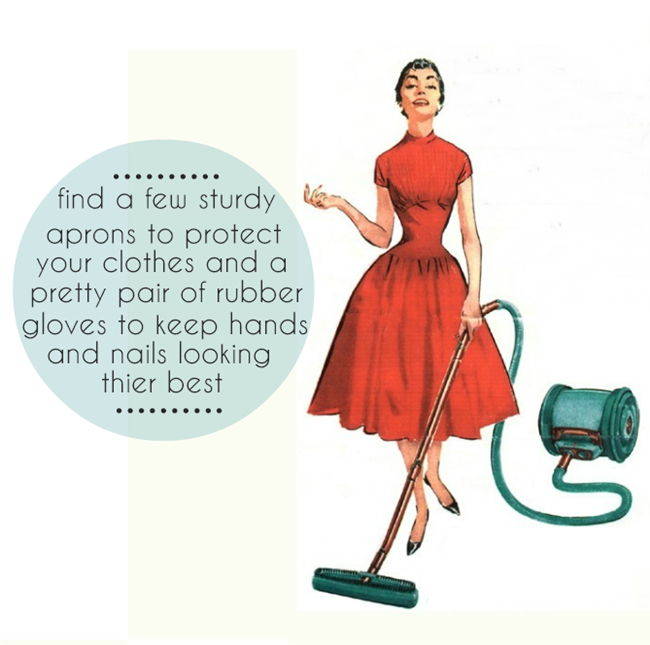 Really practical tips for housekeeping. I work full time and I have picked up a lot of things that makes life easier. Like using a timer. I set it on 15 minutes to do the basics every day- the cat's litter boxes, cleaning the toilet, and so on. I concentrate on the messiest spot in every room and if I have a really busy week and don't have much more time than that, these 15 minutes a day keep things at bay until I can really clean. Most days I also do 15 minutes of laundry or ironing and 15 minutes in one particular room. Kitchen on Mondays, the dining room tuesdays and so on. My husband do all the vaccum cleaning and mopping, so if I keep my schedule, I never have to go marathon cleaning on my free days, which opens up for sewing. Totally need this app! Especially the part about my husband being able to access it through his phone. Thank you for sharing! Wonderful tips! I completely agree that the best way to stay on top of one's housework is to start off with a really clean house and try to do a little bit every day to ensure that nothing snowballs out of control. While certain tasks are more appealing to me than others, I've always really enjoyed organizing and keeping a tidy house (I find cleaning and organizing help me de-stress and unwind), so thankfully cleaning rarely feels like an sigh inducing chore for me. A schedule is so important. And I found that one I don't have to think about is great. I use the motivated moms calendar app, because they have the whole thing figured out for me and I don't feel guilty after finishing my list and moving on to fun things because I'm confident that the house will stay clean at the pace they set. Great post, just what I need right now...thank you!! "Cute" cleaning gloves? Where, Brittaney?